getting his muddy feet prints on Everything! 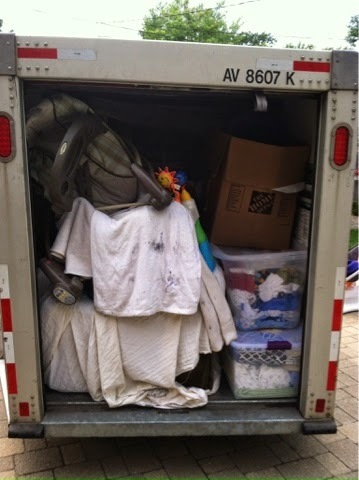 Between the baby shower and a friend of the Adama's giving us a crib, a changing station and a few other items, it made sense to rent a U-haul trailer to bring it all back here. It was a challenge to load the darn thing because we didn't have everything together at once in order to put the heavy items in the rear. 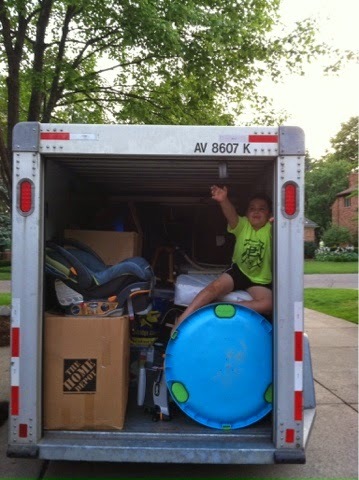 It didn't help that Little_Monkeys wanted to help and play in the U-haul. After everything was packed, Nightingale remembered that we forgot a chair and otterman so I had to rearrange a few things. It was at this point when the 6th person helpfully stated: "Don't forget you also have the back of your SUV". I'm glad six people felt compelled to tell me this because the first five just weren't clear in what message they were trying to deliver. From my years of traveling in situations like this is what often happens is you put things in the back of your car that could fit in the U-Haul and then you still have to find room for the luggage you forgot about in your room. We made the trip home in decent time though we did hit a few pockets of construction related traffic. Now the house is kinda a mess as we put the majority of the stuff in the basement. We also got an email from a Day Care Center we were supposed to tour the next day. They emailed to tell us that they filled one of the vacant spots and since we are having twins, they are canceling the tour until another spot opens up.